Some of the links below are affiliate links, thank you for supporting Southern & Style! Happy Tuesday-I hope all of you made it through the Solar Eclipse yesterday with all of your eye-site intact...seriously though! Let's jump into this weeks Ten on Tuesday. . . If you're a sucker for dogs, like I am, then you have to read the story Sam's Job. Totally got me right in the feels. As if I haven't talked about it enough already, Saturday I'm hoping that I'll have a Nashville re-cap up on the blog. We were only there Friday evening through Sunday morning (ah, the joys of being a farmers wife-having to cut vacations short), but we had an awesome time while we were there. My sweet husband let me squeeze in a stop in Huntsville so I could go in the Southern Living Store. Tory Burch is having a sale, y'all-and it's a good one, stuff is up to 60% off! This bracelet-such a steal & such a great non-traditional color! The first night Chris & I were in Nashville, our Lyft driver recommend Bakersfield Tacos for us because it was just up from Broadway (the main drag in Nashville) and we love tacos, duh-so it was a no brainer. The food was delicious so if you're ever in Nashville, I highly suggest it-but they also have locations in Charlotte, Cincinnati, Cleveland, Columbus, Indianapolis, and Pittsburgh. If you missed Saturday's post, it's one you're going to want to go back and read because it's my first style/fashion post ever on the blog! I show you my favorite boho dress & accessories...and I can't wait to share more posts like that! If you're the baby of the family & you feel my pain, check out 15 Things You'll Only Understand if You're the Youngest. If you love Lilly Pulitzer as much as I do, check out this little bio on her talking about why she created the Lilly Shift in the first place! Also, word on the street (actually word on the Lilly Re-Sale boards) is that the Summer After Party Sale will be the 28th, next Monday! They've already started taking things off of the website, I'm getting so excited. While I can't link specific items, I'm going to link a few styles I like that I hope to see in the sale. . .
Study Up: 10 Southern Style Rules to Make Your Wardrobe Brighter. Does anyone else shop the circular from your local grocery store before you meal plan for the week? I know I wait faithfully for the Piggly Wiggly sale paper to come each Monday so I can figure out at least what meat is going to be on the menu-this week, it looks like pork loin wins for at least one night. I truly love the FitBit community; it's helped me reach more goals this summer than I ever could've accomplished on my own. It also has a wealth of knowledge & interesting articles on health and wellness, exercise, basically any topic you can imagine...it also has recipes! This BBQ Chicken Salad with Tomatoes & Corn sounds like the perfect easy, light, and delicious weeknight meal for the end of summer. 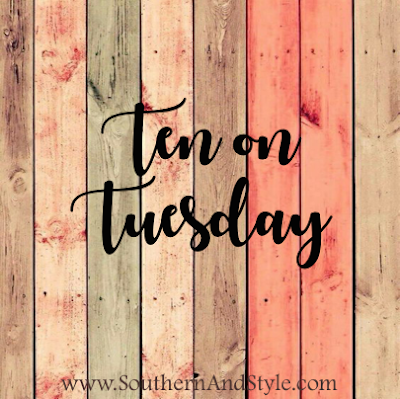 Well, y'all-that's it for this week's Ten...let me know what you've found interesting below! Ooo... I like the rules to make your wardrobe brighter!